There will be a retrospective of some of his best-loved marionettes made from found objects, originally commissioned by Museum of Contemporary Art. These will be joined by a new Cano marionette creation of Lady Gaga. 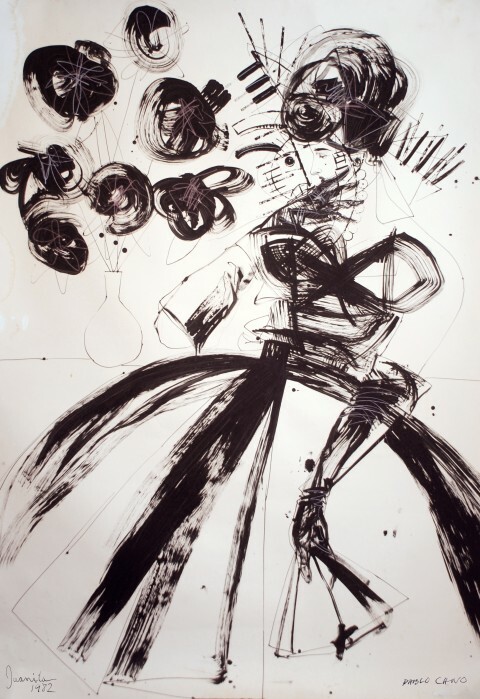 Influenced by his Cuban heritage and exile in Miami, Cano has created a new series of 50 ink drawings dedicated to Las Damas De Blanco of Havana, Cuba. These ladies are courageous protestors who each Sunday dress in white and march silently in peaceful protest to mass in support of imprisoned dissident sons and husbands. The Miami New Times has named Pablo Cano one of the “Top 100 Creatives” in Miami. Irreversible Magazine art projects featured Pablo Cano on the cover of the December 2010 issue. His marionettes, in addition to their annual performance appearances at the Museum of Contemporary Art, were featured in the windows of Hermes in New York, Palm Beach, and Bal Harbour. They are widely collected and are included in a wide range of public art museums and private collections. The Kelley Roy Gallery, in the Wynwood Arts District, will hold a special Second Saturday Art Walk 50th Birthday Celebration for Cano at its gallery on Saturday March 12th from 2 PM until 9 PM.